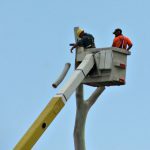 A Myaree tree lopper was fined following an incident that resulted in him and another worker being tossed from the bucket of a cherry picker onto the roof of a nearby building. The accused, Gerald Shields pleaded guilty to failing to ensure a safe work environment as provided for his employees. He was subsequently fined $12,000 in the Rockingham Magistrates Court. In May 2010, Shields was contracted by the Department of Housing and Works to undertake the tree cutting services. Shields and his employee were looping branches from the cherry picker when the front passenger stabiliser leg sunk into an old drain causing the cherry picker to topple to ground. The two men were launched from the cherry picker and onto the roof of a nearby building. Shields suffered only superficial scalp injuries but his employee suffered injuries to both his right wrist and forearm. It was revealed in court that the recommended spread plates were not being utilized for the stabiliser legs on the soft ground – contrary to operating instructions. It was also disclosed that the men were not wearing safety harnesses or any other personal protective equipment (PPE) . The court also revealed that Shields did not ensure that employees used PPE at all recommended times. WorkSafe WA Commissioner Lex McCulloch said the case was a prime example of an employer who neglected the safety of his workers. McCulloch stated that Shields had “no regard for his own safety or that of his employees”. According to McCulloch 16 WA workers had died as a result of workplace falls in almost 5 years and most cases were almost always preventable. According to a recent report released by Safe Work Australia, occupational skin diseases are the second most occurring work-related disease that general practitioners regularly treat. The report released indicated that the cost to businesses throughout Australia is about $33 million annually. Considering this significant cost to the public, it is important to be aware of how one can minimise the risks of suffering from a work related skin-disease. Workers who suffer the greatest risks are those who are frequently exposed to harmful chemicals or wet work in their daily professions. potassium dichromate in leather and cement. Safe Work Australia Chair Mr Tom Phillips AM stated that of the workers who report exposure to chemicals, less than two-thirds said they had received chemical safety or Personal Protective Equipment training. These numbers indicate that occupational health and safety training needs to implemented in every workplace in Australia regardless of how big or small and include how to properly handle chemicals and hazardous substances. This is a clear message that work health and safety training needs to be integrated in every workplace in Australia no matter how big or small and include how to properly handle chemicals and hazardous substances,” he said. Quality training then, is of significant importance. An often overlooked method of reducing risks is to practice good personal hygiene. While it would seem that personal hygiene is the responsibility of the individual worker, it is up to the employer to ensure that PPE is properly maintained and employees have access to the proper facilities and cleansing agents. When coming into contact with hazardous contaminants, the most important initial treatment should be immediately washing the contaminated part of the body, so these products are a valuable addition to industrial environments where dangerous chemicals are used. What are the problems with using personal protective equipment? 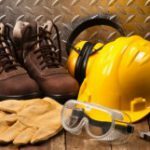 What is the worker’s duty in relation to personal protective equipment? consult with their manager if the PPE is not an adequate size or quality. If a worker refuses to wear or use the PPE, the employer can take action against the worker. 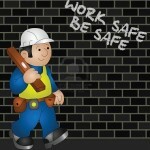 When a worker who does not wear or use PPE, or intentionally misuses or destroys it, that worker may face prosecution. As a result of shoddy personal protective equipment (PPE), inadequate safety precautions and bad weather, a Queensland floods hero has died. Peter Fenton was a 67 year old tugboat engineer when he was killed by a fallen crate that was being loaded onto a barge. Fenton, with the help of a colleague, was instrumental in steering away a 200m section of river walkway during the floods in January.An investigation into his death revealed that a hook connected to the crate had a defective spring which stopped it locking into place and allowed the crate to fall on top of him. Workplace Health and Safety Queensland’s Kym Tollenaere claims that she discovered the defective spring after the crew told her that heavy wind had caused the fallen crate.However, it was discovered through cross-examination that the health and safety officer did not discover the fault until atleast 7 hours after the death.Mr Fenton was not wearing proper protective equipment at the time. Ship Master Umesh Madhukar Dalvi claimed that the task was a common job and there was no written safety procedure for it. According to Dalvi, there was however, a written safety procedure to unload a crate, so the crew “reversed” the method to load the crate.Dalvi stated that procedure was usually to shut down the site and warn people that crates were being transferred.He expressed his shock that something of this nature could occur on a usually routine, common job. The investigation will look into; how efficiently the crate was rigged to the crane, the process used to lower crates, the level of adequately trained staff and the access to protective equipment. Fenton had previously received a medal for his brave actions during the floods.